Middle school is a great time to build independence and to start teaching kids to take responsibility for their education. I'm always looking for small ways I can let my daughter work independently. It builds her confidence and gives her a sense of authority when she takes the reins. So I was very happy to give Redbird Mathematics, an online math program, from GiftedandTalented.com a try. Keep reading to take a look at the program, what type of student would benefit from the program, and what we thought about Redbird Mathematics. I received a free 3-month Redbird Mathematics membership in exchange for an honest review. I was not required to write a positive review. I was compensated for my time spent reviewing the website and writing this post. All opinions expressed are my own. 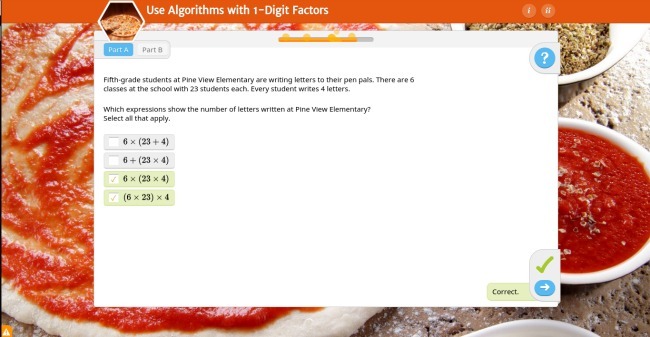 Redbird Mathematics from GiftedandTalented.com is an online math program for kids from kindergarten to seventh grade. From the creators of the program - "Our goal is to help students of all abilities become advanced learners. We believe the term gifted should be the destination and not a labeled starting point. Our courses, originally developed through Stanford University’s Education Program for Gifted Youth, have proven to increase learning, acceleration, and academic confidence for students of all abilities." Students work independently on a variety of exercises and problems often with on-screen math manipulatives (great for visual learners!). As students progress through the levels they'll have opportunities to play games and practice their acquired math skills. With more than 500 lessons and 15,000 problems, Redbird Mathematics is a rich online math program for math-loving kids. Once you've enrolled your child, you'll be emailed login information - for parents and students. All that you need to do is go to the website and get your child logged in and they are ready to go. There are online lessons to watch (over 500) and plenty of practice problems. At the beginning of a lesson, the student is presented with a progress screen with upcoming topics and lesson information. As your child progresses through the problems, they enter the answer to the on-screen problem, click on the checkbox in the bottom right corner, and a correct or incorrect message will appear. For students who need some prompting, there is a help icon in the top right corner that offers an explanation for the math problem (see the screenshot below). There's also a STEM project included. In the 6th-grade project, students create an irrigation system for farmers to harvest crops and earn money. I plan to outsource a few high school subjects for my daughter and I want her to be prepared for online courses and understand how they work. So trying a few different self-paced online programs during middle school is great preparation for the high school years. Giving my daughter the opportunity to work on math independently has been a learning experience for both of us. My daughter found Redbird Mathematics a challenge and she found it helpful to discuss the various problems presented. So, while it can be used independently we found that it worked better for us if we took the time to discuss the material. Her favorite part was the games - she found them quite fun. While it wasn't a perfect fit for my daughter (who isn't super mathy) it would be a great choice for kids who love math or advanced students. Redbird Mathematics is a challenging program that will give math-minded kids a chance to really exercise their brains! I would not recommend it for kids who struggle with math or don't like math, as they may find it too difficult. If it's something you'd want to try with a struggling learner, I would recommend using a year or two below their current grade level. For those with kids who are gifted in math or advanced learners, Redbird Mathematics would be a great option to consider. Middle school is the perfect time to try some online classes - especially as preparation for the homeschool parent who plans to outsource a high school subject or two. If your child loves math or needs a more challenging program, Redbird Mathematics would be a great option. A 3-month subscription to Redbird Mathematics is $60 and also includes a 10% discount on future months if you enroll with automatic renewal. And don't forget to sign up for their newsletter (scroll down to the bottom of the page).